Canadian Wildlife Federation: Celebrate Parks Day! It wasn’t until two years ago that I had my first real camping experience. Although growing up I spent most of my summers around lakes, it wasn’t until I moved away from home that I decided I was ready for a real outdoor adventure – and I loved it! 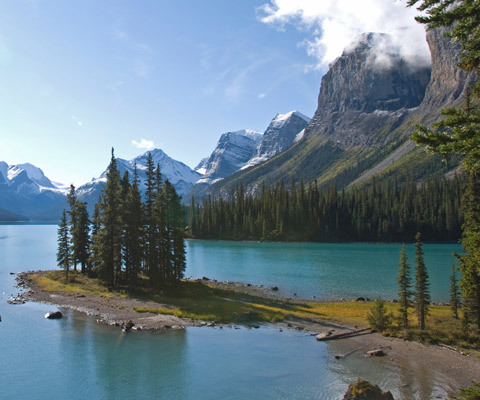 Camping is an experience that truly connects you with nature, and I hope this month’s edition of Take Five familiarizes you with some of Canada’s most bountiful, beautiful parks. After all, July 17 is Parks Day, so get outside and celebrate with your family for the day or an overnight camping trip. You can also check out parks closer to home online to plan your staycation. This park is a must-see if you are interested in whale watching. It boasts thickly forested banks, rugged cliffs and the 100-kilometre Saguenay Fjord that meets the St. Lawrence Estuary. This merger of warm and cold waters creates a rich feeding ground for whales, so keep a close watch for finbacks, minkes, blue whales, humpbacks and sperm whales. We love this B.C. park for its variety! Indulge the adventurer in you with a 75-kilometre trail through old-growth temperate rain forest, hundreds of islands for wilderness kayakers, surf lessons and summer camps. And don’t forget to pack your camera and binoculars! There’s an array of wildlife to be seen – killer whales off shore, eagles soaring overhead, sea lions in the surf and so much more! Take a trip to B.C. to discover so much of what Canada has to offer. This Georgian Bay Park was Canada’s first national marine conservation area, with 20 islands, 130 square kilometres of surface water and over 20 shipwrecks just 200 metres below the water’s surface! The best known part of Fathom Five’s terrestrial area is Flowerpot Island for its geological history, limestone cliffs, caves and “flowerpots” (the tapered columns at the water’s edge). Flowerpot Island is also the only island in the park that has trails, washrooms and camping facilities. Take a walk on the ocean floor! The tide at the Bay of Fundy can be so low at times that you can actually walk with a park interpreter on parts of the bay. But don’t gallivant alone – only experts can tell when it’s safe from high tide. Walks are offered daily in July and August. If you’re more interested in scouting out wildlife, you can see beaver lodges, deer, moose or black bears around the park. Keep your eyes peeled for the endangered and reintroduced peregrine falcon among more than a hundred species of birds nesting here. If we haven’t caught your attention with whale sightings, ancient shipwrecks or tours of the ocean floor, how about hiking across a glacier in Alberta? Take a drive along the 230-kilometre Icefields Parkway, quietly winding from Lake Louise to Jasper. You’ll spot wildlife such as elk, bear, moose or deer on your drive and revel in the breathtaking views of the Rocky Mountains, mineral rich lakes and glaciers. To top it off, plan a trip to the Columbian Icefields and be a part of Canadian history before it disappears.